In collaboration with the farming community of the Indian Creek Watershed in central Illinois, Argonne researchers are finding ways to simultaneously meet three objectives: maximize a farmer’s production, grow feedstock for bioenergy and protect the environment. Photo courtesy Patty Campbell. We ask a lot of the land: feed the world with crops, power the world with bioenergy, retain nutrients so they don’t pollute our water and air. To help landscapes answer these high demands, scientists from the U.S. Department of Energy’s Argonne National Laboratory are designing ways to improve—and hopefully optimize—land use. In collaboration with the farming community of the Indian Creek Watershed in central Illinois, these researchers are finding ways to simultaneously meet three objectives: maximize a farmer’s production, grow feedstock for bioenergy and protect the environment. These goals, as it turns out, are not necessarily mutually exclusive. All it takes is a multifunctional landscape, where resources are allocated efficiently and crops are situated in their ideal soil and landscape position. 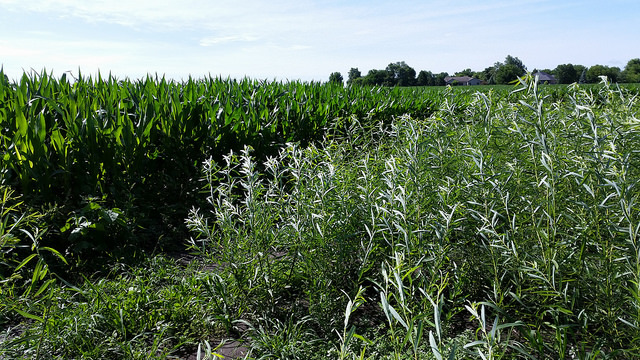 Planting bioenergy crops like willows or switchgrass in rows where commodity crops are having difficulty growing could both provide biomass feedstock and also limit the runoff of nitrogen fertilizer into waterways — all without hurting a farmer’s profits. This is what a group of Argonne scientists has discovered through careful data collection and modeling at a cornfield in Fairbury. Planting bioenergy crops like willows or switchgrass in rows where commodity crops are having difficulty growing could both provide biomass feedstock and also limit the runoff of nitrogen fertilizer into waterways — all without hurting a farmer’s profits. Illustration by John Moreno. Meeting this challenge called for a change in perspective. Rather than looking at whole fields as the unit of planting decisions, researchers analyzed subareas of the cornfield. They found that subareas with the lowest yield also had the lowest nitrogen retention. These sections of land are doubly taxing — unprofitable for the farmer and damaging to the environment. The loss of nitrogen from agricultural land is a major environmental concern. If not retained by soil or taken up by plants, nitrogen escapes into air or water. It is released into the atmosphere as nitrous oxide, a greenhouse gas with 310 times the warming potential of carbon dioxide. Nitrate leaking into water spurs oxygen depletion that harms aquatic ecosystems and can lead to toxic algal blooms, as seen in Lake Erie. The Fairbury cornfield is located within the Indian Creek Watershed, draining to the Vermilion River and eventually to the Gulf of Mexico, which for years has been suffering from oxygen depletion caused by nutrient runoff. While scientists may be invested in energy and environment, the team recognized that farmers — the true agents of change — have to think first and foremost about their economic bottom line. Researchers are collecting data on nutrient retention and loss in the soil over several years. Photo courtesy Patty Campbell. The money lost comes from farmers cropping and applying expensive nitrogen fertilizers to patches of the field that are just not producing enough. Inserting rows of bioenergy crops where there is low corn yield means the farmer is not sacrificing substantial profit from row crops. As a cost-saving bonus, the deep-rooted bioenergy crops naturally accumulate the lost nitrogen as a free fertilizer. Argonne scientists planted willows at the Fairbury site in 2013 and will continue collecting data through next year to see how results compare to their predictions. ​“We’ve already reached a 28 percent reduction in nitrate, even with two full growing seasons still ahead of us,” Ssegane said. Willow growth has also been good, without the researchers applying any fertilizer. “Multifunctional landscapes: Site characterization and field-scale design to incorporate biomass production into an agricultural system,” the most recent paper analyzing data from Fairbury, was published in the journal Biomass and Bioenergy. Funding for this research comes from the DOE’s Office of Energy Efficiency and Renewable Energy, Bioenergy Technologies Office. The Department of Energy’s Office of Energy Efficiency and Renewable Energy (EERE) accelerates the development and deployment of energy efficiency and renewable energy technologies and market-based solutions that strengthen U.S. energy security, environmental quality, and economic vitality. Learn more about how EERE’s Bioenergy Technologies Office supports the development of a sustainable bioenergy industry through its Sustainability Program. The Department of Energy’s Office of Science is the single largest supporter of basic research in the physical sciences in the United States, and is working to address some of the most pressing challenges of our time. For more information, please visit sci​ence​.ener​gy​.gov.